Billy Decker threw everything he had at Sheppard to try and retake the lead off the final restart with five laps to go, but fell 0.923 seconds short of a victory. Decker did manage to win an extended battle with Larry Wight to extend his point lead, which was just two markers entering the event. Ransomville regular Erick Rudolph and Stewart Friesen rounded out the top-five. The 100-lap race began with local pilot Kenny Wills III on the pole and Jimmy Phelps to his outside. Phelps led the opening lap and paced the field through a trio of cautions in the first 30 laps before Decker made his bid for the top spot. Decker seized a lap 32 opportunity when Phelps bobbled on the cushion in turn two, allowing the No.91 to race to the bottom of the track and take the lead. It was brief, however, as Phelps retook the point the following lap, but remained under siege from Decker until the two drivers exchanged the lead again on laps 38 and 39. On lap 40, Sheppard got past Phelps for second and set out to track down Decker. The caution waved again on lap 41 when Keith Flach slowed in turn four. When the race resumed on lap 47, Friesen jumped to third while Sheppard continued to pressure Decker. On lap 49, Sheppard made the decisive move of the race when he drove under Decker in turn four to claim the lead. 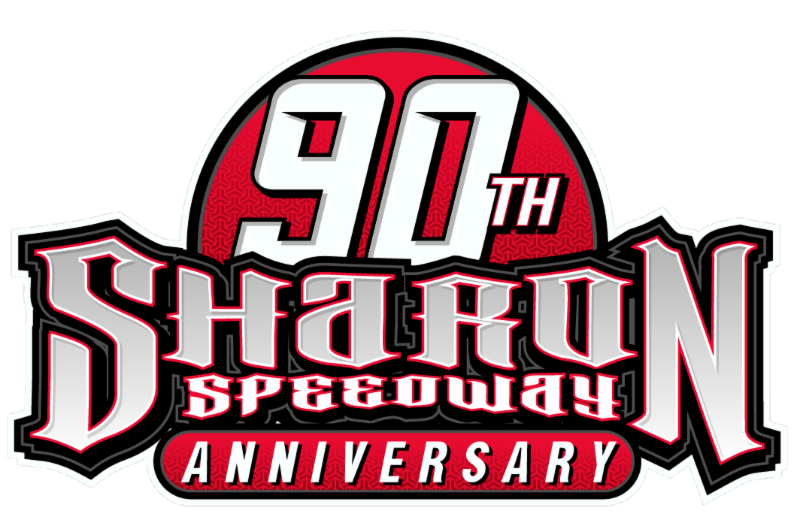 Over the final 52 laps, Sheppard pounded his No.9s against the cushion in turns one and two, but tried both the inside and outside lanes in turns three and four as he navigated through the traffic. Wight jumped into the top-three off a lap 62 restart and then spent the better part of the final 35 laps dueling side-by-side with Decker for second. Wight lost the battle on lap 86 when he went off the track in turn two trying to avoid contact with a lapped car. It was the second time in the race Wight had to take evasive action to quickly avoid serious problems. Earlier in the race, he hit the outside wall and all but destroyed the body on the right side of the car. Regardless, Wight was happy with the run. Sheppard was able to outpace Decker in clean air over the final 10 laps, but restarts on laps 93 and 95 forced him to hit his marks as Decker lurked within five car lengths each time. Wight was the race’s KSE Hard Charger, advancing seven positions from 10th to 3rd. Decker was the Fast Qualifier with a lap of 16.151 seconds around the 3/8-mile oval. Decker, Wight Sheppard and Max McLaughlin claimed heat race wins. McLaughlin was also the recipient of the Speedy First Aid Hard Luck Award after a he slowed on lap 57. He was able to race his way back to 14th, but lost out on a top-10 finish. Ransomville’s 358 Modified weekly points leader Ryan Susice won the Last Chance Qualifier. McLaughlin and Mike Mahaney were eligible for the 811 Dig Safely New York redraw bonus award if either could win from the eighth or eleventh starting positions, but were unsuccessful. The Super DIRTcar Series returns to action on Wednesday, August 9 at Merrittville Speedway for the rescheduled Bob St. Amand Memorial 100. Race time is 7:00pm with Hot Laps and qualfiying taking place beforehand at 6:15pm. For additional event information, visit www.merrittvillespeedway.com. 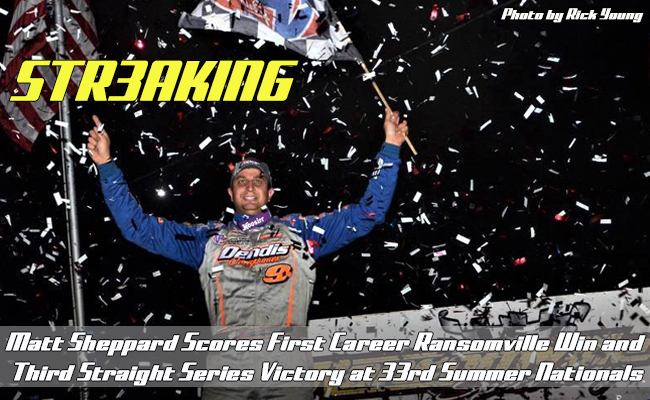 For complete results from the Super DIRTcar Series 33rd Summer Nationals at Ransomville, click here. CONTINGENCY WINNERS: VP Racing Fuels ($50 Cash): Pat Ward; Fast Qualifier ($100 Cash): Billy Decker; Bicknell Racing Products ($100 Product Certificate): Matt Sheppard; Cometic Gasket ($50 Cash): Jeff McGinnis; Comp Cams($50 Cash): Peter Britten; Comp Cams ($50 Product Certificate): Matt Sheppard; Edelbrock ($50 Cash): Peter Britten; Fox Racing Shocks ($50 Cash): Erick Rudolph; JE Pistons ($50 Cash): Stewart Friesen; JE Pistons (Product Certificate): Jeff McGinnis; JE Pistons (Product Certificate): Brandon Walters; KSE Racing Products Inc. ($50 Product Certificate): Larry Wight (+7); MSD Ignition ($50 Cash): Matt Sheppard; MSD Ignition ($25 Cash): Kenny Wills III; SuperFlow Dynos & Flowbenches ($50 Cash): Jeff McGinnis; Wrisco Aluminum (Product Certificate): Matt Sheppard; JRI Shocks ($50 Cash): Max McLaughlin; Dig Safely 811 Redraw Bonus ($100 Cash): N/A; Speedy First Aid Hard Luck Award (Product Certificate): Max McLaughlin; ASi Racewear ($50 Cash): Mike Mahaney.